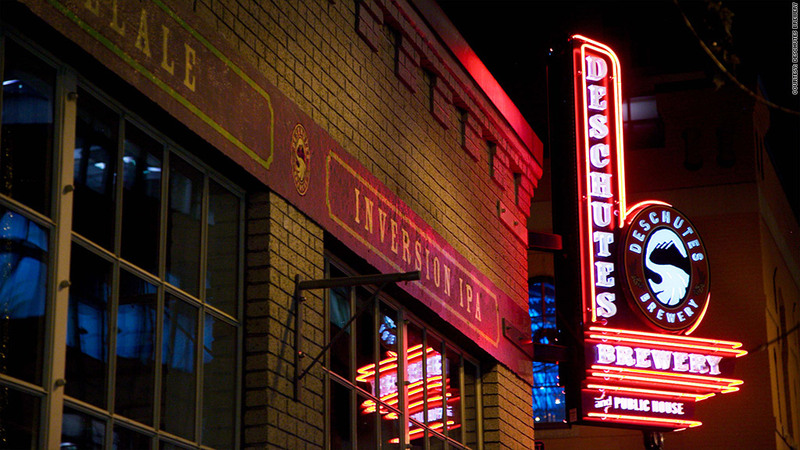 Started in 1988 with only 3 employees, Deschutes Brewery now employs 400 people and and has brewpubs in Bend and Portland, Ore. The business of craft beer has exploded. In five years, craft beer has nearly doubled its market share, growing rapidly even as the industry as a whole has contracted. The Brewers Association defines a craft brewer as "small, independent and traditional," and the United States is home to 2,286 of them -- the most since before Prohibition. "The first decade [after opening] was very tough," said Mike Stevens, who started Founders Brewery with Dave Engbers in 1997. "You had to beg distributors to carry your beer and hand-sell to one retailer at a time." Founders, based in Grand Rapids, Mich., started with just three employees -- including the two co-founders -- and spent the first decade "flirting with bankruptcy ... just trying to keep our heads above water," said Stevens. The brewery now employs approximately 130 people and distributes to 23 states, with plans to add three more this year. Many of today's biggest craft brewers actually got their start in the '80's. "It was all by the seat of our pants," said Larry Bell, who founded Bells Brewery in 1985. Based in Kalamazoo, Mich., Bells is now the seventh largest craft brewery in the United States, with 207 employees and two production facilities. Bells distributes in 18 states, plus Puerto Rico and Washington, DC. and soon plans to expand to New York State. Craft breweries make up 6% of the total market volume, up from 3.7% in 2007, and had revenue of $8.7 billion in 2011, compared to $96 billion for the industry overall. But the beer industry is overwhelmingly dominated by two players: Anheuser-Busch InBev (BUD) (ABI) and MillerCoors (a joint venture between SABMiller (SBMRF) and Molson Coors (TAP)). Together, they have about 75% of the market in terms of sales volume, and it's not just their big-name brands. The companies are also responsible for a number of specialty brands like Bass, Hoegarten and Shock Top (ABI), and Blue Moon, Leinenkugel and Pilsner Urquell (MillerCoors). They've also worked to get in on the craft market: Anheuser-Busch InBev bought Chicago craft brewery Goose Island in 2011. Last week, the Justice Department sued to block a merger between ABI and Grupo Modelo (GPMCF), which makes Corona, saying the acquisition would "likely substantially lessen competition." The merger was criticized by brewers like Steve Hindy, the co-founder and president of Brooklyn Brewery. In an op-ed for CNN.com, he said it was bad for craft brewers because the larger breweries have significant influence over the distribution channels, which gives them an inordinate amount of say over what retailers carry -- and even where the beer is placed on the shelves. But while the distribution element has been cause for concern, brewers are seeing an improvement. "The mindset has changed over the last several years as the industry has blossomed," said Stevens. "[Distributors] need to carry craft beer in their portfolio to stay competitive." And craft beer has moved well past your basic IPA, hefeweizen and porter. Delaware's Dogfish Head ages its Palo Santo Marron in barrels of exotic Paraguayan wood. Founders brews its Kentucky Breakfast Stout with coffee and chocolate, and then ages it in oak bourbon barrels. "We're only restricted by our imaginations," said Michael LaLonde, COO of Deschutes Brewery in Bend, Ore. "As we get more creative with styles and flavors, people will want to try new things." LaLonde said the 25-year-old brewery isn't that worried that the bigger players are moving into the craft market. "It's flattering that other breweries try to copy the styles and flavors of craft beer," said LaLonde. "But if we focus on our experimentation with new flavors and consistently get high-quality beers to our fans, we're not really concerned with what they're doing."